I’ve enjoyed nature all my life. I was that kid, tromping in the woods, turning over logs to marvel at the life beneath, watching the patterns of light and shadow on leaves to see the hidden snake. Getting a camera with a good macro, and learning to take close-up shots, has taught me to look even closer – now, even without the camera, I see all kinds of neat things happening that I never even knew were there. Evolution is amazing, and the diversity of life is profound and humbling. This house has been a revelation as well – our yard backs up to a wooded creek, and we garden organically, so there’s an abundance of life that I think would be missing in a lot of city dwellings. I’ve seen things here that I had previously only heard of, and many that I never even knew existed. We’ve got mantis flies, and tortoise beetles, and cuckoo wasps, and thread snakes. I’ve found several things where I’ve looked them up and read “Not much is known about their diet or habits” and just had to smile and shake my head at the amazing depth and complexity of life. I found this cool tiny critter one night, luring moths to a sheet with a black light to see what would show up. It’s called Petrophila jaliscalis, less than half an inch long, and my eye was caught by the beautiful spangles on its rear wings. I couldn’t find anything like it, searching on the web. I put a request on Bugguide.net (an amazing resource, if you’re trying to ID something weird) and they pinned it down. This odd genus lives as caterpillars on stones in running water – creeks, streams, rivers. 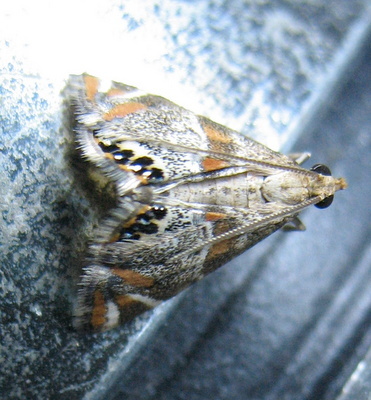 What I didn’t find out until a lot more recently – there’s a very cool reason for the spangles on its wings. This whole genus mimics jumping spiders to help scare off predators. I found a jumping spider in the kitchen one afternoon, and got the macro lens and the ring light and shot some pictures. I’m still working on getting a firm ID for this spider, asking some smart folks on a Facebook spiders group; so far, it’s looking like Maevia inclemens. Keep in mind, this whole spider is about the size of a pencil eraser – but with a macro lens, you can see it in magnifying-glass detail. Here, it’s on the border where the white trim meets the yellow-painted wall… you get a sense of scale from the bubbles in the paint. and then you adjust the lighting, and you shoot, and you shoot, and you find where the damned thing ran around the corner of the wall, and you move, and you shoot some more, and then you crop, and you adjust… and you get the portrait. I’m not a trained photographer, and I know there’s a lot that I could have done better – but I’m proud of this one. It wasn’t until I saw an article about a spider-mimicry in metalmark moths, that I thought, “Hmm… those metallic marks look like the ones I saw on the little guy on the sheet!” and started looking into it. And it all came together. I still want to get a better angled shot, so you can really see the “eye” and “leg” markings in the same positions. If you squint your eyes at the moth, you can definitely see the spider – and if you were some hungry bug, you might think twice. This is one of a dozen or more examples of Batesian mimicry I’ve seen in the yard; we’ve got ant-spiders, and bee-flies, and so many scary eyes.